Dhaka, Jan 28 (Just News): Observing that the date for giving verdict in a graft case of their chairperson Begum Khaleda Zia has been fixed hastily as part of a government’s plot, the BNP standing committee on Saturday night urged people to be vocal against it. "The entire nation has got worried and aggrieved over the fixing of date to pronounce the verdict hurriedly. We think it is part of a conspiracy to destroy democracy and foil an inclusive national election," said BNP secretary general Mirza Fakhrul Islam Alamgir. He further said, "Our national standing committee at their meeting strongly condemned and protested the government's such unlawful attitude to harass innocent persons, including our leader Khaleda Zia, in false, fabricated and politically motivated cases. We urge people to get united and be vocal against the government's plot in the name of trial." An hour after the BNP policymakers sat in an emergency meeting, Fakhrul came up with the remarks at a press conference at BNP chairperson's Gulshan office. 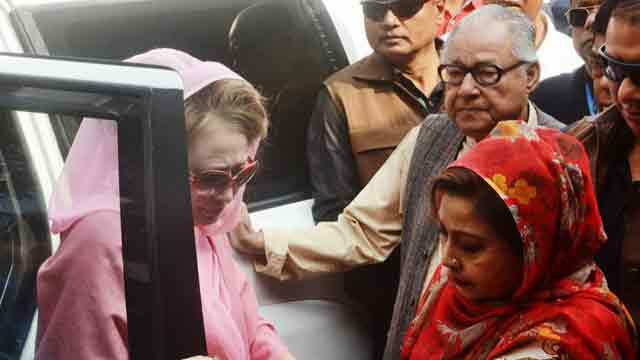 On Thursday, the Special Court-5 in Dhaka fixed February 8 to deliver the verdict in the Zia Orphanage Trust graft case against Khaleda and five other people. The ACC filed the Zia Orphanage Trust graft case on July 3, 2008 with Ramna Police Station accusing Khaleda, her eldest son Tarique Rahman, now living in the UK, and four others for misappropriating over 2.10 crore that came as grants from a foreign bank for orphans. Khaleda Zia will be disqualified for the next general election if she is convicted in the case. Asked whether their party policymakers worked out any action programme, he said they will unveil it once the verdict is announced. Fakhrul said the court concluded the trial proceedings in the case promptly and abruptly set the date for delivering the verdict. "Our senior lawyers think the court's move is not only unusual and unexpected but also mysterious." He said the country's people think the move was taken as part of the government's evil design to keep BNP and Khaleda Zia out of the next general election. The BNP leader said it seems the government and the ruling party knows what will be the verdict the way they are making comment on it and talking about preparation to tackle the situation likely to be emerged after the pronouncement of the judgement. "It can clearly be understood that another example of suppressing the opposition is going to be set using the court by staging a farce in the name of trial," he said. Earlier, the BNP standing committee members sat in the meeting around 9:30pm with Khaleda Zia in the chair. The meeting concluded around 11:45pm.